Marvel originally tapped filmmaker Edgar Wright (Shaun of the Dead, Big Fuzz) to write and direct the film, but Wright left the project mid-production due to creative differences causing Marvel to scramble for a new director before selecting Peyton Reed (Bring it On, Down with Love, Yes Man”). Adam McKay and the film’s star Paul Rudd were also brought in to rework Wright and Joe Cornish’s original script. Despite all those changes, Ant-Man holds together well. Yes, it’s clunky in parts and sometimes feels rushed, but it’s certainly not the mess fans feared it might be. Wright’s creative DNA is still present in dialogue and various set pieces. Even then film’s climactic fight scene has shades of the director’s trademark playfulness. At a fleet 117 minutes, the film is tight and briskly paced, moving along a decent clip avoiding extraneous narrative detours. Characters are developed just enough so it’s satisfying, but we don’t spend more time than needed getting to know any of them. Throughout the film it feels like there are forces at work trying very hard to hold this thing together. 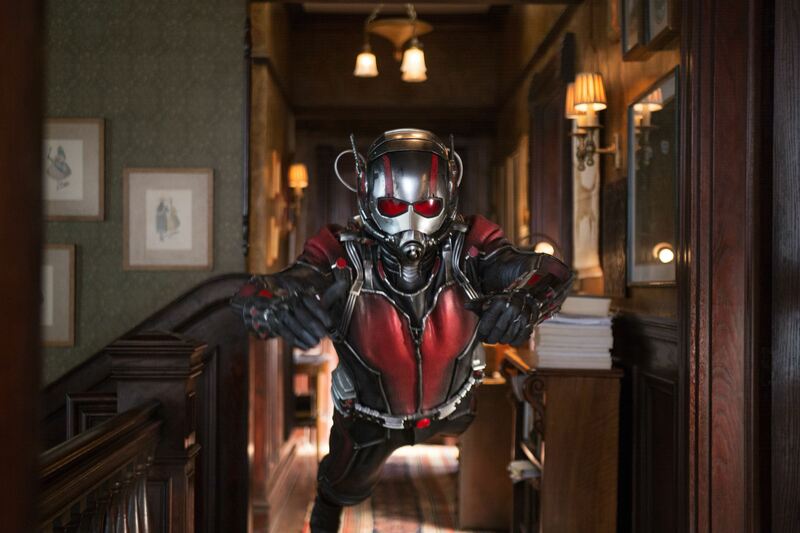 At moments, Ant-Man feels like it could fly off the rails into silliness and camp. That it all doesn’t go to hell is a testament to the cosmic power of MCU architect and producer Kevin Feige. Credit is also due to Reed, who, in the unenviable position of replacing Wright, does a fine job keeping the spirit of Wright’s vision alive without aping his style. That said, Reed doesn’t leave much of his own mark on the film. The film’s MacGuffin — a particle with reality-altering potential — will have big implications for the MCU at large. Ant-Man, however, smartly chooses to tell a smaller and lighter story. And it’s all the better for doing so. Like Guardians of the Galaxy, Ant-Man also successfully stands on its own. Several references place it within MCU continuity — including a great Avenger cameo — but viewers who have fallen behind in the series will not be lost. This is a fairly straightforward heist movie with a playful feel that doesn’t take itself too seriously while finding room for action and a little bit of heart. The first act takes some to find its feet, but once it does this movie is a lot of fun. Rudd is expectedly funny and charming as Scott Lang, a talented thief with a good heart recruited by Dr. Hank Pym (Michael Douglas) to recover some dangerous tech from his deranged former protégé Darren Cross, played well by a menacing Corey Stoll. Douglas does a solid job as the prickly and regret-filled Pym. In the comics, Pym is a complicated, often unlikable character. The MCU version smartly streamlines his backstory, jettisoning his affiliation with the Avengers. Here he is a scientist who created the Pym Particle, which decreases the distance between atoms. In lay terms, it makes stuff smaller. Pym also developed a suit that harnessed the power of the particles, and used it during his time as a S.H.I.E.L.D. agent running black ops missions in the 1980s. We get some of this backstory in the film’s prologue, which also features some unexpected cameos from a couple of Silver Age MCU characters we’ve seen before. Back in the present day, Cross has cracked the formula for Pym Particles and developed a suit of his own, which he plans to sell to a newly constituted Hydra — the evil organization last seen laid to waste in season two of ABC’s Agents of S.H.I.E.L.D. Enter Lang to help Pym save the day. Along the way, both men are hoping to mend broken relationships with the respective daughters. Evangeline Lilly (Lost), in a very Wasp-y hairdo, plays a frosty and combative Hope van Dyne. Lang, meanwhile, needs to prove he’s worthy of his own daughter’s love by making an honest living. Cassie, played here by Abby Ryder Fortson (who’s also currently one of the creepy kids on ABC’s The Whispers) is a doe-eyed sweetie with nothing but love for her flawed father. Judy Greer (Archer, Married) and Bobby Cannavale (Boardwalk Empire) also show up as Cassie’s mom and step-dad. Neither has a lot to do here, but both are welcome additions to an overall strong supporting cast. The movie comes to a head in a great action sequence that allows Reed and his effects team to create some dynamic visuals as characters and objects shrink and grow within scenes. Throughout the film, we’re treated to similarly awesome visuals that play with size and perspective. (The scenes with Lang commanding his army of ants are also great fun.) The climax, however, really has fun with the concept, zooming in and out and finding humor in pulling back to show the scale of a high-stakes fight between two adversaries that are the size of ants. By now, we’re accustomed to knockdown, drag-out third act battles. Ant-Man resists this trend by keeping the stakes decidedly lower and literally smaller. Property damage is minimal. There are no civilian casualties. The film’s biggest fight takes place on a model train set. Ant-Man succeeds by being simultaneous heady and goofy, diffusing high-concept science with a small personal story and likeable characters with clear motivations. Like I said, this is tight film, and while it may have felt rushed at times, it was a refreshing palate cleanser for the MCU after the slightly bloated but still good Avengers: Age of Ultron. Nerdpick #1: Peggy Carter and Howard Stark might be the two most clueless bosses in the entire MCU. Everything we’ve seen about the history of S.H.EI.L.D. under their management suggests they let the place go to hell. I had assumed that they left or were driven out much earlier than 1989, which is when we see them here. But apparently they were asleep at the wheel for almost 40 years while Hydra infiltrated S.H.IE.L.D. right under their noses. Maybe subsequent seasons of Agent Carter will explore this. Nerdpick #2: Howard Stark being alive in 1989 creates a potential continuity issue. We know Hydra killed Stark at some point, but Iron Man 2 seemed to suggest it happened when Tony was a young child. In 1989, Tony would have been at least a teenager. Am I missing something? Do I now have a reason to rewatch Iron Man 2? Props to Michael Peña as Luis, Lang’s ex-con buddy, who steals the show in what could have been a very annoying comic relief role. Boy, that Falcon cameo was a lot of fun. Superheroes fighting each other the first time they meet is a classic comic book trope. Lang’s simultaneous terror and excitement at tussling with an Avenger was great. And Anthony Mackie is a great Sam Wilson. I hope we don’t have to wait until Ant-Man 2 to see Hope in that kickass Wasp suit. Sorry, Young Avenger fans, Cassie Lang is way too young to be suiting up as Stature anytime soon. Though, given how goofy (in a good way) that final fight was, a giant toddler running around the San Francisco suburbs would not have been totally out of place. While our journey into the Quantum Realm was sufficiently trippy (even if it did look like the iTunes Visualizer at times), I wish we got a better sense of it as a place. I was kind of hoping for a Micronauts cameo, or maybe Dr. Strange in his astral form. That end-of-credits stinger scene though. Captain America: Civil War is going to be bananas.